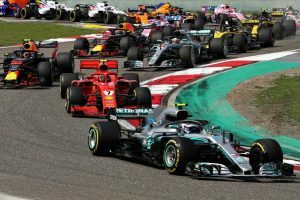 The F1 2019 schedule reaches its third race of the season Sunday, the Chinese Grand Prix in Shanghai. As will be the case for much of the 2019 season, ESPN2 will be the TV channel that will broadcast this weekend’s Formula One race, with a start time of 2:05 a.m. ET on Sunday (or, essentially, Saturday night). The Chinese Grand Prix also can be live streamed via the ESPN app. Sunday’s race in China will be the 1,000th Grand Prix in 70 years of F1 racing. It will be the 16th edition of the Chinese Grand Prix. Naturally, Mercedes’ Lewis Hamilton, the driver with the second most wins in Formula One history, will be the favorite to add to his total of 74 career victories. Yes, Hamilton has won five times in China (four from pole), and no other driver has won in China more than twice. It is also true that Hamilton and teammate Valtteri Bottas have the opportunity earn Mercedes GP one-two finishes in each of the opening three Grand Prix races of the season for the first time since 1992, when Nigel Mansell and Riccardo Patrese did it for Williams. But the dominance of the Mercedes team this season has developed alongside the struggles of Ferrari. The Ferrari duo of Charles Leclerc and Sebastian Vettel seemed to have things figured out a couple weeks ago when they qualified first and second, respectively, for the Bahrain Grand Prix. But Leclerc finished third, and Vettal finished fifth. If Vettel fails to finish on the podium in China, the German will have failed to reach the podium in the opening three races of the season for the first time since 2008, when he was with Toro Rosso. Also looking to get back on track in China is Red Bull Racing’s Max Verstappen, who is third in the F1 driver standings behind Bottas and Hamilton. After his win in Mexico last year, Verstappen has failed to better his finish from each previous race; he finished second in Brazil, third in Abu Dhabi and Australia, then fourth in Bahrain. Below is all you need to know regarding how to watch the 2019 Chinese Grand Prix, the third race of the F1 schedule, including the TV channel, live stream info and start time for Sunday’s race. As it has in years past, in the United States, ESPN will broadcast Sky Sports’ presentation of 2019 F1 races. Below is the TV and live streaming schedule for Chinese Grand Prix qualifying and race presentations on ESPN platforms Thursday, Friday, Saturday and Sunday. F1 qualifying for the 2019 Chinese Grand Prix is scheduled to take place Saturday, April 15 at 1:55 a.m. ET and will be broadcasted live on ESPN2 with a live stream available on the ESPN app. The F1 qualifying results for the 2019 Chinese Grand Prix will be posted upon completion of Saturday’s session.